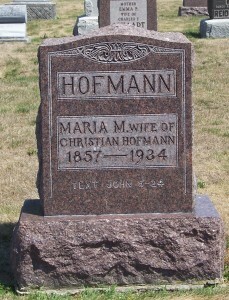 Tombstone of Maria M (Schinnerer) Hofmann, Evangelical Protestant Cemetery, Van Wert County, Ohio. This is the tombstone of Maria M Hofmann. The stone is inscribed HOFMANN, Maria M., wife of Christian Hofmann, 1857-1934, John 5-24 [text]. 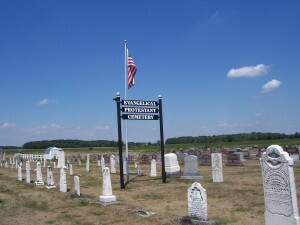 The tombstone is located in row 2 of the Evangelical Protestant Cemetery, Harrison Township, Van Wert County, Ohio. Maria was enumerated as Magdelena Hoffman in the 1900 US census, Monroe, Allen County, Indiana, with husband Christian and their eight children. She was enumerated as Marie M Hofmann in the 1910, 1920 and 1930 US censuses in Pleasant Township, Van Wert County, Ohio. According to the 1910 US census Maria had 9 children and they were all living. In 1920 she was a widow, still living in Pleasant Township with her children Adolph C, Otto J, Herman, August R, and Pauline. Marie was living with children Otto J and Paulina A in Pleasant Township in 1930. 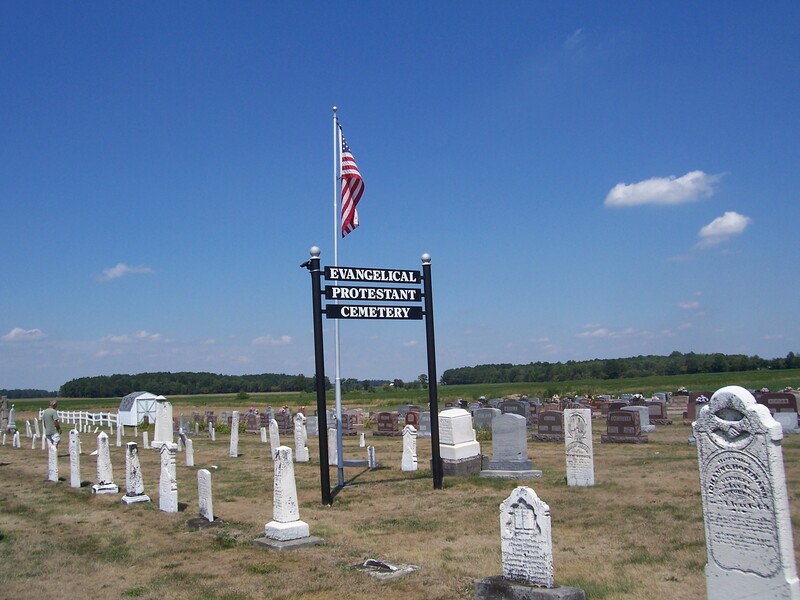 I was able to determine the names of Maria and Christian’s children as well as estimate their birth dates and places of birth by using the 1900 and 1910 censuses: Julia A (Jun 1881), Fredrick J (Aug 1883), Amelia L (1884), Henry C (Nov 1886), Otto J (Nov 1889) Adolph C (Sep 1891), Herman J (Apr 1893), August R (Aug 1897), and Pauline AC (c1905). Their first eight children were born in Indiana and Pauline was born in Ohio. 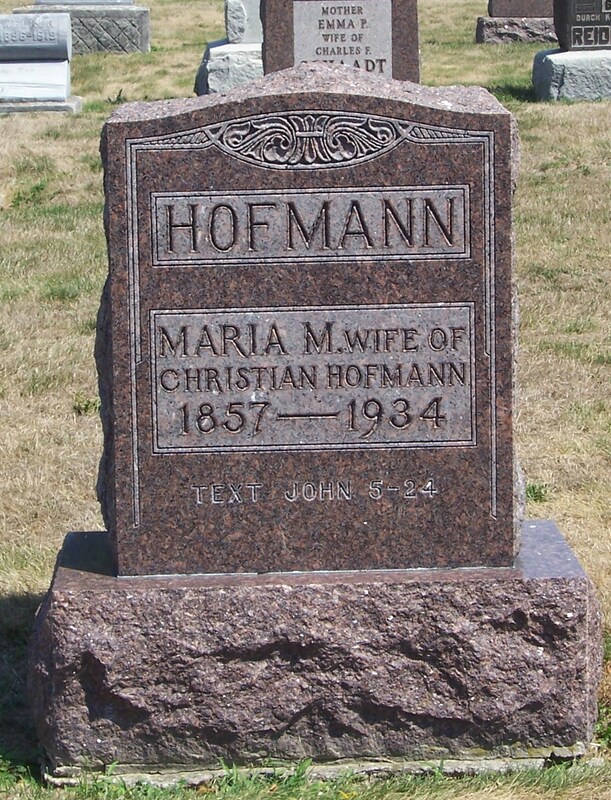 Maria’s husband, Christian Hofmann, (1854-1914) is buried in row 5 of the Evangelical Protestant Cemetery.